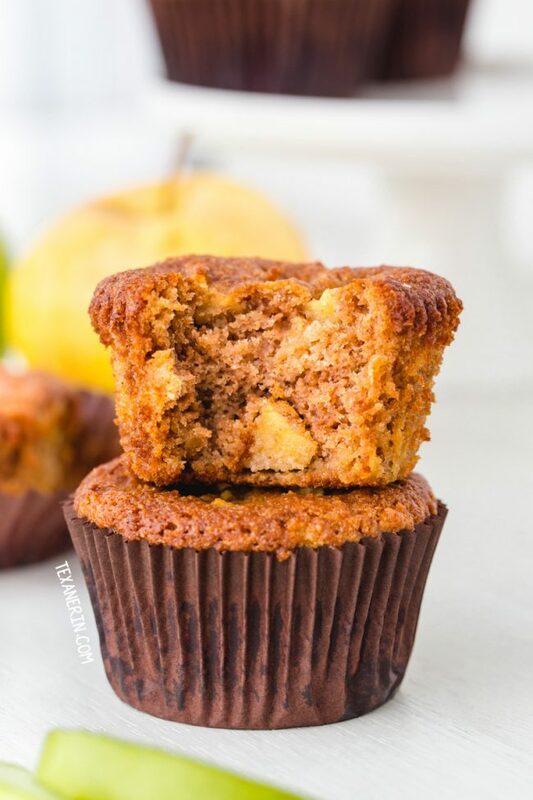 These paleo apple muffins are fuss-free and completely maple sweetened. They get extra apple flavor from grated and diced apples. Thanks to Pure Canada Maple for making today’s post possible! Pictures updated on 10/1/18. 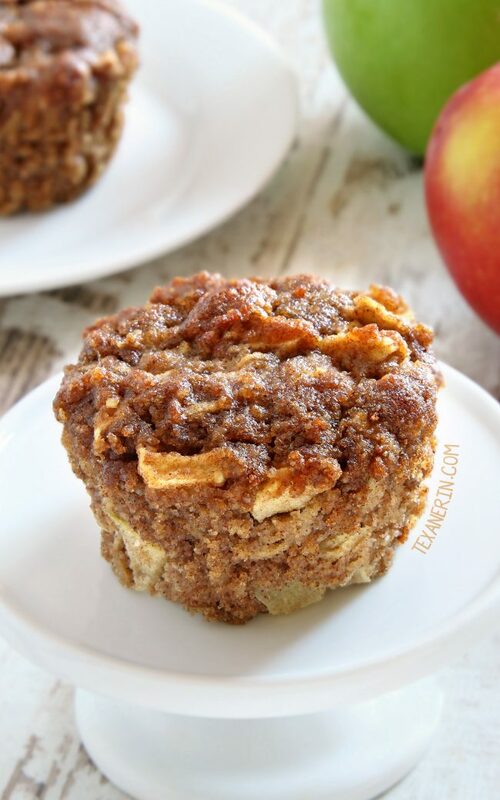 I’ve been wanting to post a paleo apple muffin recipe for a long time. At first I tried adapting the paleo blueberry muffins I posted recently. They’re my favorite muffin recipe, by far, but that didn’t work out. The cinnamon and spices just made them weird. The carrot cake recipe uses 1/2 cup of grated carrots and I subbed that with 1/2 cup of coarsely grated apples. I’ve only made these muffins using this extra coarse grater to grate the apples so if you want to use a fine grater, I have no idea how that’d work out. I’d be afraid that the muffins would come out too wet. These muffins are already super moist so I don’t know if they could handle even more moisture! The carrot cake recipe uses honey but 100% pure maple syrup seemed like a much better choice for these autumnal muffins. I used the exact same amount! It’s an easy sub and I think it blends better with the apple + cinnamon + nutmeg combination than honey does. You can use any grade of all-natural maple syrup in these. You can’t really taste it through all the cinnamon flavor so I went with the standard Grade A Medium Amber kind that’s usually sold in grocery stores around here. I save the darker, stronger tasting and slightly more expensive Grade A Dark Amber kind for dishes where I want the maple taste to shine. One tablespoon of cinnamon may seem like a lot for 8 muffins (it’s 3/8 teaspoon per muffin) but I’ve tried these with less cinnamon and they just weren’t very exciting. You need the cinnamon! I’ve also tried these with a bunch of different apple types and we could hardly detect there were apples in the muffins – until I made them with Granny Smith. Their tartness helps them stand out more and together with the cinnamon and maple syrup, creates a truly awesome apple muffin. Thanks again to Pure Canada Maple for sponsoring today’s post! As always, all opinions expressed are my own. One of the old pictures for reference for those of you who have made these before! Preheat the oven to 350°F (175°C). Line a muffin pan with 8 muffin liners. In a large bowl, mix together the eggs, oil, pure Canadian maple syrup, and vanilla. Divide the batter evenly among the liners, filling them almost full, and bake for 23-25 minutes or until a toothpick inserted in the middle comes out clean. Store in an air-tight container at room temperature for 1 day or refrigerate for up to 4. I added the coconut sugar to the recipe in October 2018. Before that, no coconut sugar was listed and the reviewers loved them that way! Only add the coconut sugar if you like things to be on the sweeter side. 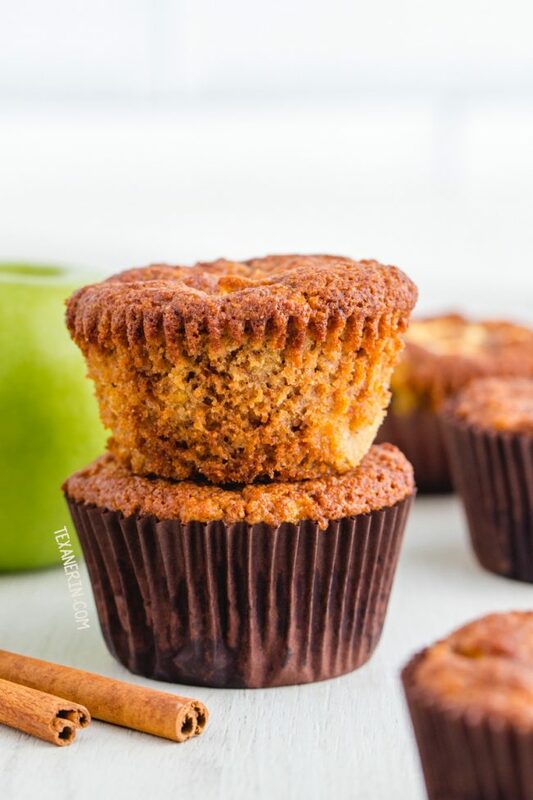 228 comments on “Paleo Apple Maple Muffins (grain-free, gluten-free, dairy-free)” — Add one! I’m kind of a muffin addict! And these look great – can’t get enough apple in my life! Wow! These are absolutely amazing! I didnt have a coarse grater so I used my spiralizer. I also subbed honey for the syrup and omitted the coconut sugar. They are plenty sweet and delicious without the extra sugar! This is one of those recipes that makes me wonder why anyone would ever need to have white flour or sugar! Hello! Any idea on how many calories per muffin? As usual, I love this recipe. I made them this morning–so easy and delicious! I really like using almond flour over regular flour because it is more filling (other than the obvious benefit of less carbs). My daughter loves these as well–she said they should be called apple pie muffins! Thanks again!! That would have definitely been a more exciting name. ;) I’m so glad that you and your daughter enjoy them! Thanks for your comment. What can I use instead of almond flour? I’m allergic to nuts! 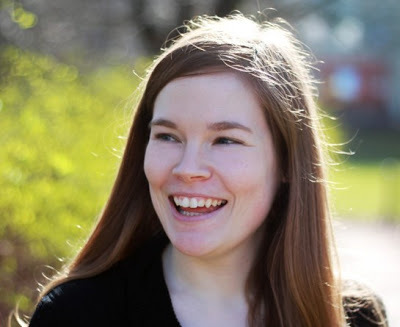 Love your recipes Erin! Could I use coconut sugar instead of the maple syrup? I am so sorry for just now seeing your comment! We just got back from a vacation where I had internet reception very infrequently. I haven’t tried these with coconut sugar but I think it’d work. Someone else used it (and I believe they didn’t add any extra liquid, which you normally do when subbing a granulated sweetener for a liquid one). Hi Erin, the video shows that coconut sugar is added to the wet ingredients, but I don’t see coconut sugar on the ingredient list or recipe. I made these with my girls last night and added 2 tbsps. of coconut sugar and they were amazing! Just wanted to know if we can omit the coconut sugar all together next time. I made these as mini-muffins for my son’s 1st grade class, and they are sticking to the liners quite a lot. I have a second batch in the oven, and added a bit more coconut oil to see if that might help, but otherwise, do you have any idea why they might be sticking? They’re rather messy (but delicious!). I’d hate to make his teacher deal with the mess if I can prevent it. 🙂 The liners I’ll using, if it matters, are brand new & Wilton brand. Hi there! Sorry for just now seeing your question. I’m pretty sure it’s the liners. I have the same issues with lots of muffin recipes. They stick badly to some liners and not at all to others. I live in Germany so what liners I use isn’t helpful to you but are the Wilton ones waxed? Because that kind seems to work most of the time for me! Can I replace maple syrup with other sweetener, like erythritol or sukrin? Any thoughts on how to make these pumpkin muffins as well? We love these and would like to make them pumpkin for fall! So sorry for just now seeing this! There’s no way to just add pumpkin puree to the recipe without reworking it but I can recommend my paleo pumpkin muffins or paleo pumpkin cake. :) Hope you’ll like them! How many carbs in each muffin? Do you suggest peeling the apples before grating and chunking? Can the recipe be doubled (or really 1.5x) to get a full 12 muffins or do I need to do 2 separate batches? Thanks! Thanks Erin! Made these and they are fantastic! They freeze well too for a quick breakfast on the go. Had some leftover Braeburn apples so I used those- and they were perfect! My kids loved them, and I’m pretty sure all 8 were gone in less than 2 hours. Yay! I’m happy that your kids loved them and good to know that Braeburn work well. Thanks for your comment! Do you think your recipe could be made in a loaf pan instead of muffin cups. I wanted to make a quick loaf or coffee cake for Mother’s Day brunch. I haven’t had a good experience with converting grain-free muffin recipes to loaf pans so I wouldn’t recommend it. Sorry about that! How about regular cake pans? I made these for the first time last week, and my family and I loved them! I used pink lady apples instead of granny smith because that’s what I had. Otherwise, I made them exactly as the recipe stated. They were wonderful and will be added into our rotation. Thanks for a great recipe and I look forward to trying many more of your recipes. You’re welcome! I’m happy that they worked out well and I hope that you’ll enjoy the other recipes just as much. :) And good to know that Pink Lady apples work well. Thanks for your comment! could you replace yogurt for the coconut oil? I only have unrefined coconut oil and worry ti will be too strong. could i sub., yogurt for the coconut oil to add moisture? or would you suggest something else? I’ve never used that sub so I’m really not sure. Sorry about that! The muffins are already so moist so there’s no need to worry about adding moisture. I think there’s so much cinnamon in these that you wouldn’t taste too much coconut, if any. 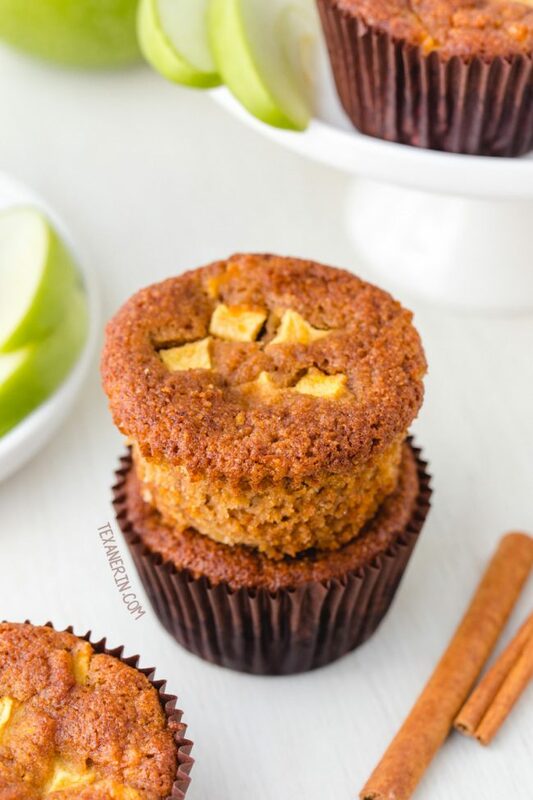 Do you have the nutritional information for these apple muffins? They are delicious but I need info for a diabetic in the house. I don’t but you could use this recipe analyzer if you’d like for that info. :) I’m happy you liked them! What altitude did you make these at so I can adjust for high altitude (9,0000 feet)? Sorry for just now seeing your comment! I just looked up my altitude. 556m or 1825ft. Hope you’ll enjoy the muffins! I browsed the comments and didn’t see where anyone said they used all almond flour. Would this work? I am HIGHLY allergic to coconut. With the coconut allergy- this means I would need a diff oil too- so would avocado oil work? Olive oil would work but I think avocado oil would taste too strongly. Coconut flour’s not interchangeable with almond flour so you unfortunately can’t just use the same amount of almond flour. You could try adding a bit more almond flour, but I have no idea how much. I’m guessing at least 5 tablespoons but it’s just a guess. Sorry about that! Can one substitute anything for the maple syrup in this recipe? Has anyone tried to sub flax egg for the eggs? I have an egg intolerance and am wondering how well it would work for this recipe. Thanks! I unfortunately haven’t tried it. It’s always kind of risky in grain-free recipes like this. Sorry I don’t have a better answer for you! Haha. I like how positively you think. :) I’m happy they still came out tasty! Thanks for reporting back. These were awesome. I was just wondering how many calories were in each one. can muffins and/or cookies be frozen? Muffins and cookies in general? Or these muffins? I’ve never tried freezing these muffins but I think it’d be fine! Awesome! I’m happy to hear that you liked it. :) Thanks for your comment! Kinda disappointed with how mine turned out. I’m thinking I must’ve done something wrong. Before pouring into the pan they were very crumby, it wasn’t like a batter…which might be how it’s supposed to be I dont know. But when they finished they have an overpowering baking soda flavor. Not very sweeet😕kinda a cornbread texture. I’m thinking you’re right and something must have gone wrong! Did you make any changes or subs at all to the recipe? None of the other commenters have had that issue (and I’ve made these tons of times) so either one of the ingredients or one of the measurements were off. Or perhaps you really, really packed the almond flour? But even then, I don’t think it’d come out crumbly and dry. There have been times when I follow one of my own recipes (which has nothing but great reviews) and they come out terribly. Then I realize I added too much or too little of something. It happens. :/ I’m sorry! I hope you’ll give them another try. :) Maybe you could use a scale next time, if you didn’t last time. They definitely should be nicely sweet and muffin / cake-like. Not like cornbread. You definitely just can’t omit them. You could try a flax egg but it’s always kind of risky in grain-free recipes like this. I made them with a flax egg (1 Tbsp. flax to 3 Tbsp. water). Although the muffins were a little more crumbly, they were still delicious! After researching these are approximately 267 calories each. These are everything my fall dreams are made of! I just got back from the Apple orchard and was dreaming of Apple Cider Donuts. Thank you! Made these yesterday, add 1/2 cup chopped walnuts, weighed all ingredients and they were fabulous! Thank you! These are delicious! I found this recipe because I had some left over chopped apple, so using only chopped and no grated was fine. Also did not add all of the syrup. Delish! Thank you! That’s great that they worked out without the grated apples! Thanks for your comment. :) I’m happy to hear that you liked them! I never post comments. I mean never. But these are hands down the best muffins I have ever tasted. Thank you so much! Aww, thanks! I appreciate you taking the time to comment. :) I’m so happy you liked them! Moist and delicious! Even my fiancé with a discerning palate loves these. Flavors are comforting and remind me of fall. So good! Thanks! You’re welcome! I’m happy to hear that you both liked them. :) Thanks for your comment! I just made these and tasted sooo good! However, mine did not rise. It looks the same. It doesn’t look like the picture. What do you think I did wrong? I made sure I followed directions and all the ingredients in. Just wondering if you have tried this recipe with a flour other than almond? I need to replace that due to a nut allergy. I have not had luck substituting flours in the past :). This looks like a good recipe, hopefully I can figure out how to make it work for us! I just made these for tomorrow’s breakfast. My picky toddler and I couldn’t wait to try them so we split one for dessert. I’m not sure I have had a muffin this delicious in awhile! They are really fantastic! I only had some Fuji apples so I used two small-ish ones and reduced the syrup to a “heaping” 1/4 cup. I shred all of the apples instead of chunks (picky toddler). I had 1/2 teaspoon of lemon juice in the fridge so at the last minute I threw that in (not sure if it did anything :-) ). Chopped walnuts would be a delicious add. Thank you for this recipe! THese muffins are a favourite in our family! As well as the banana chvovolate muffins! Thanks for the great recipes! You’re welcome! So happy you like them. :) Thanks for your feedback! Thank you! I just put these in the oven. I made the chocolate banana muffins last week and my kids destroyed them. They are super excited about trying these. This is one of my new favorite sites! Yay! I’m so very happy that you’re enjoying the recipes. :) I hope your kids liked these muffins just as much (though it’s hard to compete with gooey, melty chocolate, isn’t it? ;)) Thanks for your comment! It’s up to you! I believe I peeled them but they don’t have to be. Any idea on calorie count per muffin? I saw that coconut sugar was used in place of honey? Didn’t see honey in receipe. Did you mean in place of maple syrup? I never mention coconut sugar in my post or recipe. Are you talking about one of the comments below? If so, I think they meant to say maple syrup! I hope you’ll see my comment! The email address you left doesn’t seem to be a valid one. Can these be made in a cake pan instead of muffin pan? I’d love to try for a potluck but thought be easier in a 9×13 pan. Course I probably have to double recipe. I will be trying it next week. Is 1 Tbsp right for the cinnamon? I just wonder if it would be strong since I’m going to triple the recipe so it would be 3 tbsp. I’m going to make in the cake pan this Friday! Hope it turns out yummy. Sorry for my slow reply. I just got back from a vacation where I didn’t have any reception! But hopefully you found your answer in the post where I talk about the cinnamon amount. :) I’m not sure if I’d triple this recipe. I haven’t tried it myself and think it may be a little risky. And to be honest, I have no clue if you should triple the cinnamon, salt, etc. If you try it out anyway, I’d love to hear how it goes! So I tripled the recipe. But only used 3 cups apples and 2 tbsp cinnamon. Bake in 9×13 pan for 40 minutes and it taste fine. I’m hoping it’s moist. I only tasted edge because it’s for a potluck. I did notice it was jiggly in center after 30 minutes even though toothpick came out clean. It came out good! Really moist everyone liked it. I baked it for the 40 minutes and jiggle was gone. That’s great to know! I’m sure that’ll help out some other folks who want to convert this to a cake recipe. :) Thanks again! Thanks! Coconut flour is unfortunately not interchangeable with any other flour as it absorbs so much more liquid. Sorry about that! Could I use a gluten free flour mix (from Costco)? Have you tried subbing the almond and coconut flours for a GF to know it just won’t work with this recipe? In a different recipe forum that called for those, someone replaced with GF cup4cup and said it turned out great. I was just curious. So I wasn’t sure if it was something to do with the apples or what have you so I made the other recipe I mentioned yesterday and it turned out awesome. When this pumpkin coffee cake is gone I will try this recipe and give you a verdict on the GF. 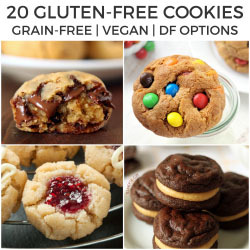 Could I use regular flour in place of the almond and coconut flours? I’m not sure if sub out okay. I know, I know. Shouldn’t use reg flour. But still wondering! I substituted the 2 eggs for 2 flax eggs and used barely flour instead of coconut flour. I also used a loaf pan because I couldn’t find the muffin cups.